The 37th Annual Wine Festival kicks-off Thursday, May 16 with a selection of Winemaker Dinners at area restaurants. On Friday, May 17, select wineries feature their Library, Reserve, White/Rosé, and Futures complemented by fresh and local gourmet bites at the RESERVE Event. Start your morning on Saturday, May 18 with a fun and educational Winemaker Seminar. 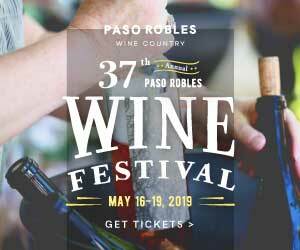 Following the seminar, more than 70 wineries come together in the Paso Robles Downtown City Park to showcase their wines during the Grand Tasting. Wineries at the Grand Tasting will be arranged by “regions” for a seamless and focused tasting experience: Bordeaux-style, Rhône-style, Zinfandel, Burgundian-style, Italian varieties and Other Wild Wines for your tasting pleasure.